My feet are killing me! - Find out what is causing your foot pain today! What you wear on your feet is the most important part of foot care. One quarter of the bones in your body are located in your feet, and your feet are the foundation and support for the rest of your body. If you are experiencing foot, ankle, knee, lower back or shoulder pain, it very well may stem from an improper care of your feet. These pains are often caused by the style and fit of your shoes. A supportive shoe, combined with the proper (arch support) insert, will put your foot in its natural position for walking and standing. By putting your foot in balance, the alignment of other joints will be improved; properly aligned joints means less pain. The average person walks the equivalent of 3.5 times around the world during their lifetime. 90% of all people wear improperly fitted shoes. Ouch!! The human foot contains 26 bones, 33 joints, and over 100 tendons, muscles and ligaments. That’s an awful lot of places for pain to occur. Most foot problems are caused or aggravated by poorly fitted shoes. What to do if your feet are hurting? Ice massage, rolling your foot over a cold plastic soda bottle will do wonders for a painful arch by reducing the inflammation. Try a proper (arch support) insert. 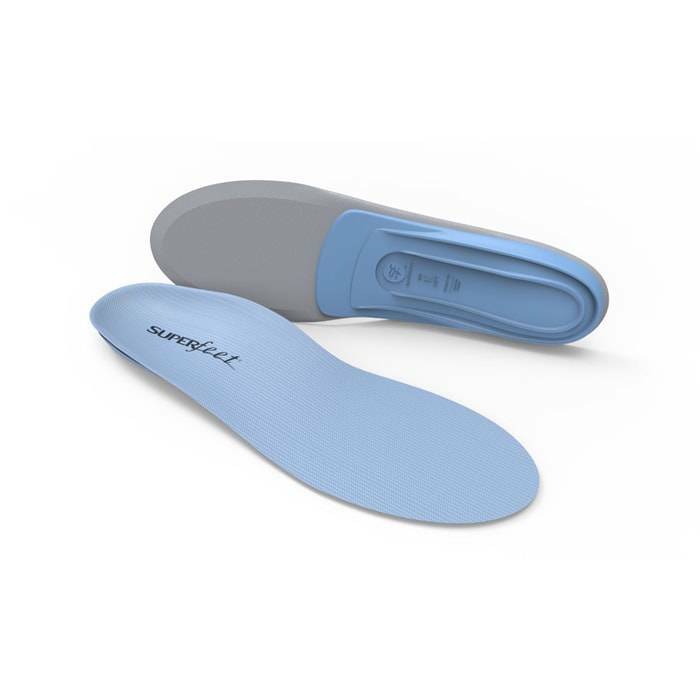 Inserts are supportive devices that fit into shoes and support your feet. When properly fit in your shoes, the insert acts as an interface between the foot, the shoe and the ground. With a proper insert you are supporting your foot and ankle while standing and walking, as well as improving your balance, alignment, performance and comfort any time you are on your feet. 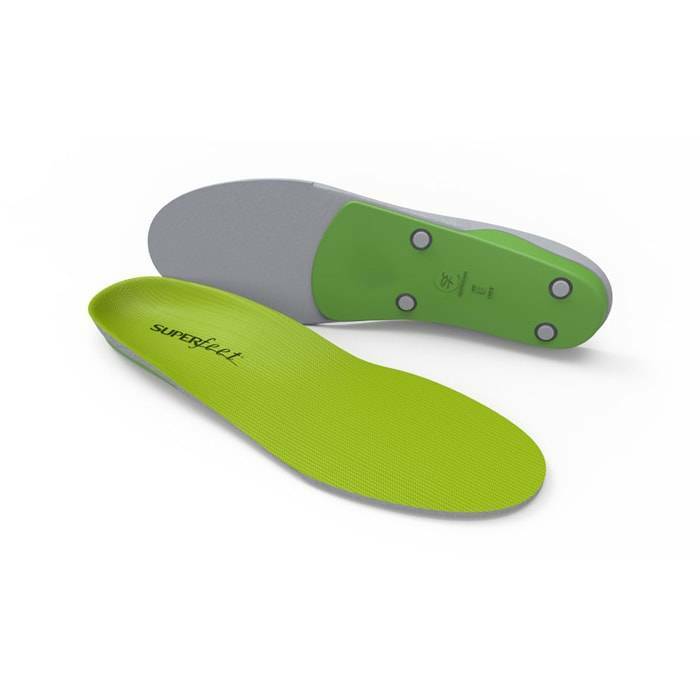 Allowing more equal weight distribution relieves undesirable stresses associated with foot pain and discomfort across the under surface of the foot. Which supportive shoes can help me with foot pain? 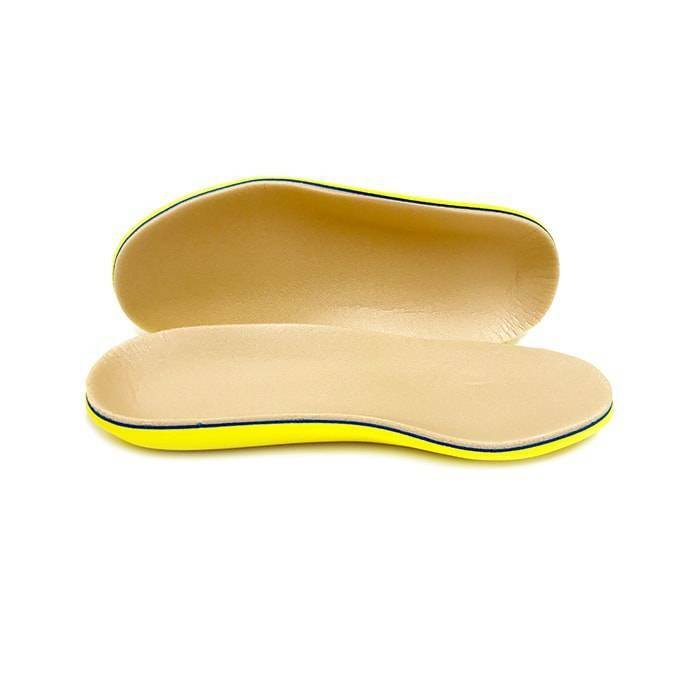 Built in arch support or removable insoles to accommodate orthotics. Below are supportive walking and running that help reduce foot pain. Can arch supports help me reduce foot pain? They sure can! The arch supports can effectively help support your arches and evenly distribute pressure across your whole foot. However, before you purchase any pair of arch supports, (we recommend visiting any of our stores for a free foot analysis.) We can help you find the best arch supports based on your foot type, gait (the way you walk) and most importantly your shoes! Below are various arch supports help eliminate foot pain. You only get one pair! In your lifetime you will walk over 100,000 miles! Care for your feet with proper shoes and inserts will improve the overall structural health of your feet. Remember, you only get one pair of feet. Take care of them. Where to buy Comfortable Shoes to help ease my Foot Pain? Come into any one of our stores located in Anaheim Hills, Costa Mesa, Rancho Cucamonga, Riverside, San Dimas, Temecula, La Quinta and Palm Desert! Visit us today so you can try on a pair of Comfort Shoe or Wide Shoes! At Lucky Feet Shoes, we carry many comfort shoes, wide shoes, and arch supports. Come and visit us today! If you are looking for comfort shoes, wide shoes or arch supports in Anaheim, Anaheim Hills, Yorba Linda, Brea, Orange, Placentia, Costa Mesa, Santa Ana, Fullerton, Irvine, Villa Park or Tustin; then visit our store in Anaheim Hills or Costa Mesa. If you are looking for comfort shoes, wide shoes or arch supports in San Dimas, Glendora, Pomona, Covina, West Covina, La Verne, Azusa, Diamond Bar or Claremont; then visit our store in San Dimas or Long Beach. If you are looking for comfort shoes, wide shoes or arch supports in Rancho Cucamonga, Ontario, Upland, Fontana, Rialto, Chino, Chino Hills, Mira Loma, Eastvale, Colton or San Bernardino; then visit our store in Rancho Cucamonga for your footwear needs. If you are looking for comfort shoes, wide shoes or arch supports in Riverside, Moreno Valley, Corona, Rubidoux, Loma Linda, Grand Terrace, Redlands or Norco; then visit our store in Riverside for your footwear needs. If you are looking for comfort shoes, wide shoes or arch supports in the Temecula Valley, Murrieta, Fallbrook, Lake Elsinore, Wildomar, Hemet, San Jacinto, Pala, Sun City, Menifee, Canyon Lake, Perris, Bonsall or Anza; then visit our store in Temecula for your footwear needs. If you are looking for comfort shoes, wide shoes or arch supports in Indio, Coachella, Thermal, Vista Santa Rosa, Valerie; then visit our store in La Quinta for your footwear needs. If you are looking for comfort shoes, wide shoes or arch supports in Cathedral City, Thousand Palms, Palm Desert, Palm Springs, Desert Springs, Rancho Mirage or Bermuda Dunes; then visit our store in Palm Desert for your footwear needs.